The Cybergo from Induct, zero emission and zero driver, but it goes! I think it will happen sometimes, but I’m not waiting for it. AGVs Autonomous Guided Vehicles. They drive by themselves. I’ve already seen a few of them. Robots. Robotized vehicles. You get inside as you would get inside a cab but there isn’t a driver to drive you. Several tests have already been done, most notably in Amsterdam, where a few AGVs were in use at the airport’s parking. But nobody has ever put one of those on the street among traffic. That’s not the plan yet. 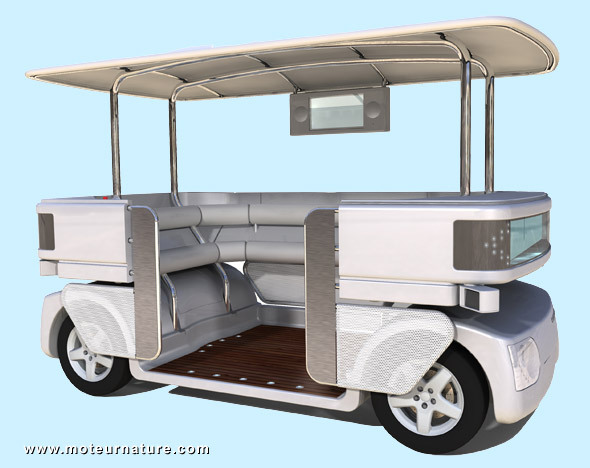 The Cybergo from French company Induct is an electric 8-seater. It drives itself, even in places that haven’t been structured for it. Induct says it would perfect inside an university campus or in any large pedestrian area. I have little doubt it wouldn’t, but I’m not ready to the idea of having of robotized vehicles around me. The concept disturbs me. I guess that as a tree-hugger, I enjoy nature, animals, but I can’t appreciate robots, and I don’t think I ever will. The Cybergo will be at the Geneva motor show, even if I don’t like it, I’ll have a closer look at it.